I had been without a gaming-capable computer for some time, and so I often feel like I'm still playing catch-up with several games. And it probably doesn't help that I've invested in quite a number of Humble Bundle deals over the years in anticipation of getting a better computer. But now that I have one, I'm a little overwhelmed with how any games I have in my Steam library. Costume Quest wasn't exactly a game that I thought I would get into based on the title alone. But given it's a Double Fine game, I figured that it wouldn't hurt to try it out sooner or later. A few Humble Bundles later I realized that I already "owned" a copy of the game and it was just a matter of installing it and trying it out. The game looks pretty simple compared to a lot of games on the market, but it has turned out to be nice little casual game that once can pick up after a long day at work. And while it was originally designed for consoles, the PC translation works pretty well and has eaten up quite a bit of my time. 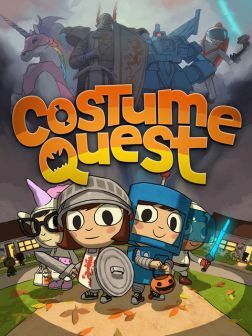 Costume Quest is a role-playing game created by Double Fine Productions and published by THQ. It was designed by Tasha Harris and has been available for a wide variety of platforms. It's Halloween and you and your twin are about to go trick-or-treating. Depending on whether you choose Reynold or Wren is really more a visual choice (hooray for gender options!) since the story will more or less play out the same way. Your character will dress up in a homemade robot costume while your sibling will dress up as candy corn. And because of this, your sibling will eventually get kidnapped by a monster who is looting the town for candy. And now it becomes up to you to rescue your sibling and stop the monster plot. The exploration part of the game basically has you going around town collecting bits of candy. Candy is the game's currency, which you use to purchase items like Battle Stamps that help your characters in combat. You can find candy on the ground or you can bop a mailbox or some other part of the environment and hope some candy falls out or you can go trick-or-treating. And typically you need to visit all houses in an area before you can proceed. You also need to hunt down materials that you can use to create new costumes that will open up new opportunities for your characters. The other part of the game is the actual combat, which happens any time you encounter one of the monsters either walking around or hiding in one of the trick-or-treat places you try your luck with. Then things shift to a turn-based environment where you're all larger than life versions of your characters facing equally large monsters. Thus your little cardboard robot costume turns into a full anime-worthy mecha-style suit complete with a higher attack that rains missiles down on your enemies. You pretty much select your target and try for an attack (or a Battle Stamp special move) and then you can also hit a key corresponding to the instruction given on the screen similar to Kingdom Heart's trigger commands. Things seem simple enough, but I still find myself missing various trigger commands here and there. That can either lead to me dealing less damage or being unable to block enemy attacks, but it's all part of the fun of the game system. The interesting contrast between navigating the world and fighting the monsters makes for a fun back and forth shift. But more importantly there's a story at work here and the slightly repetitive game play is off-set by the various quest challenges you face in each map. You have different Halloween activities like bobbing for apples, costume contests and trading candy themed trading cards because why not? But all the different quests help you either get more candy or gather more materials needed to build more costumes, and those are pretty essential in the long term. After all, you need to save your sibling before the monsters figure out that the candy corn is just a costume. The art style is pretty adorable and this again creates quite a shift between the exploration part of the game versus the combat part of the game. I was a little disappointed that the citizens of the town generally follow thin or fat body type models and not much variation beyond that, but I can understand the need to keep things simple in order to maximize gameplay. On the whole, Costume Quest is a lot of fun and don't let it's kiddie-like sensibilities fool you into thinking this is a simple game. It's still a fairly solid RPG experience of a sort but definitely of a simple scale that makes it pretty approachable across different agent groups. So I'm happy to rate the game a great 4 clever costumes out of a possible 5.